Honor has recently released the Honor View 20, and at the moment the phone is doing great. It sold in over 1.5 million units in the first month. However, it seems that Honor is still not done. A new rumor seems to point out towards the company making another flagship device, this time named Honor 20 Pro. It will come with the new Sony IMX600 sensor. The Honor 20 Pro will come with a 6.1″ OLED display with an in-display fingerprint scanner. This will be the first global Honor phone to have this technology. So far, only the Honor Magic 2 has this technology, but it is only sold in China. Also, The Honor 20 Pro will be powered with a Kirin 980 chipset and it will come in three memory configurations: 6/128GB, 8/128GB and 8/256GB versions. We also expect the phone to come with a triple camera setup. 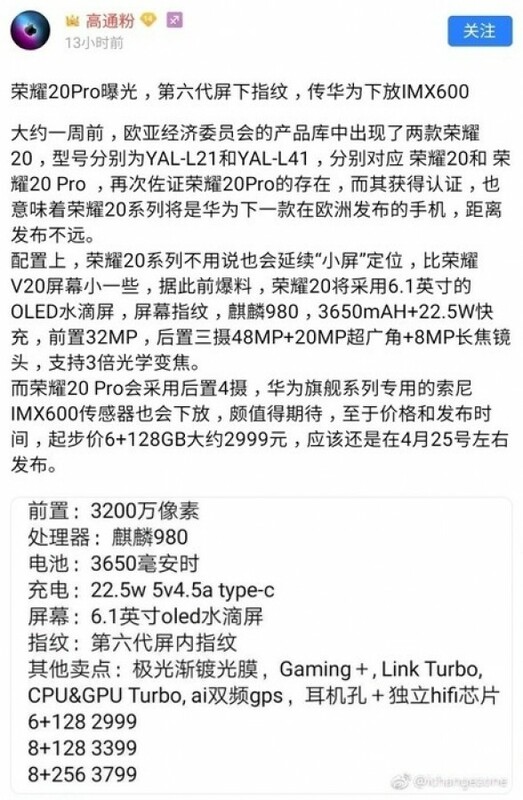 The main sensor will have the resolution of 48MP, just as the Huawei P30 Pro. The secondary camera will be a 20MP ultra wide sensor and the third sensor will be an 8MP telephoto sensor. The front-facing sensor will bear 32MP resolution. The phone will come with all standard software boosters such as Gaming+, Link Turbo, CPU and GPU Turbo, etc. It will most probably have a 3650 mAh battery with 22.5W fast charging support. Rumors say that this phone will be priced at around $450, which is a great price taking into account the specs.